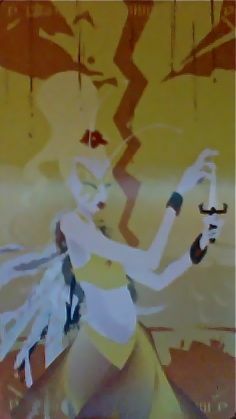 Today's Draw Classic*: The Princess of Swords from the Tarot of the Silicon Dawn. Do you ever wonder if you're just a little too whacked out for this world? Do you ever worry that maybe something's just a little "off" or a little "broken" inside you? How would life be different if you could completely let go of self-criticism and self-doubt? This particular Princess of Swords is a hot mess. She's ungrounded. A mix of contradictions. Riding an emotional rollercoaster. A little lost. But somehow it all works for her. This is who she is. And, as the book says, she's still so much more than she even realizes. I'm someone who has a pretty strong energy about me. And that energy is almost always positive and supportive and kind. Because of this, people sometimes make assumptions that I'm really easy going about things and won't mind if they're lax on their end of our relationship, whether it's a business or personal one. That's a bad assumption to make. Like the Princess of Swords, my blade cuts both ways. There's a saying "do not mistake my kindness for weakness." That's a perfect saying for me. I won't pitch a fit or go out in a blaze of fire. I'll just calmly state why it's not working out for me and quietly walk away. And when I'm done, I'm done. So how does this relate to the mess of contradictions that is the Princess of Swords? Well, because we all have contradicting natures. I can be—and am—a genuinely warm and supportive person. But take advantage of that—or fault me for that—and you don't get the best of me anymore. Sure, maybe there are FREAKS out there who are terribly consistent in everything they do, walking through life with no contradictions (at least not any they'll let out of the closet). And then there are people who do have emotional and/or psychological issues that need tending. But the bulk of us rest uncomfortably in a middle ground where we're oddly all over the place, following a logic that only makes sense to us. And here's what the Princess of Swords has to say about that: It's OK. You and your weird mix of contradictions and eccentricities are as exotic and unique and beautiful as the flower in her hair or the mark of the butterfly on her cheeks. How would life be different if we could just believe this about ourselves? If we could move through each day knowing we're good just the way we are? Just imagine...things like passive-aggression and misunderstandings and taking things personally would just fade into the woodwork! I'm not going to stand before you and tell you I'm there...haha. There is much about myself I still have to come to peace with. But what I can do is take a vacation from insecurity, self-criticism and doubt on Wednesday, March 27th. And if that doesn't work out, I can try again on Thursday, March 28th. Because as the book so eloquently tells us about the Princess of Swords (and, of course, ourselves), "Poor crazy butterfly. She's the only thing that holds herself back from flying."